Steaming, delicious herbal teas have become a favorite beverage for many people. In fact, people have been drinking herbal teas for centuries for their great taste and incredible medicinal properties. Along with being an easy way to up your fluid intake, herbal teas are packed with extra nutrients. Unlike coffee, they do not contain caffeine, which is linked to different health problems. Herbal teas are made from different parts of the plants, such as the flowers, roots, seeds or bark. Making herbal tea is easy. You just need the herb in fresh or dried form, some hot water and less than 10 to 15 minutes to prepare a cup of tea. Here are the top 10 herbal teas for good health. 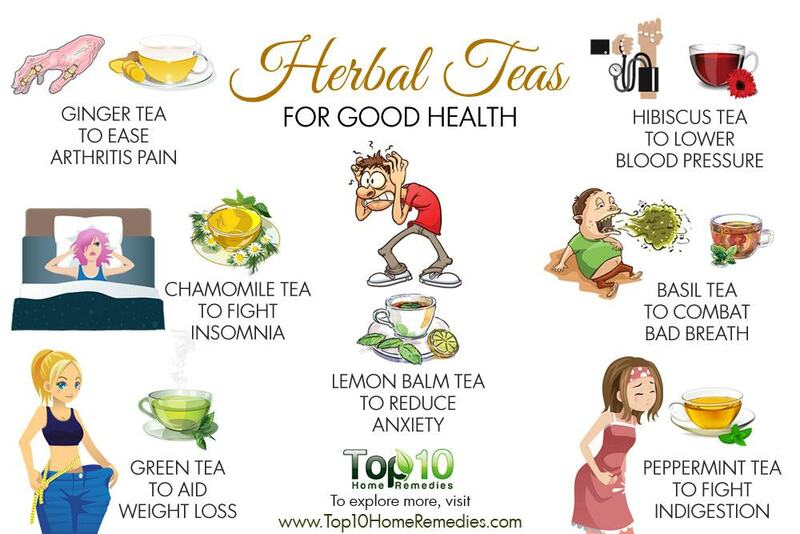 Any list of healthy herbal teas will definitely start with green tea. 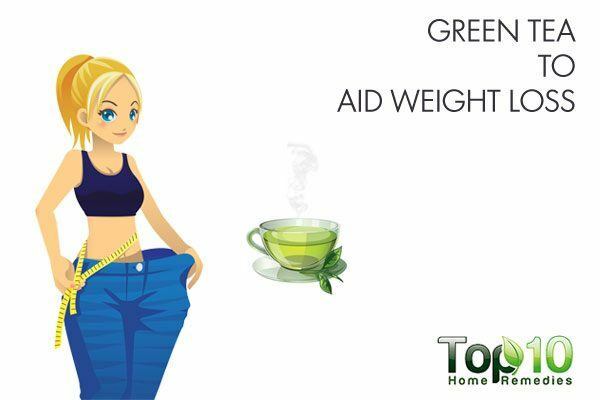 One of the main benefits of green tea is that it supports weight loss and fights obesity. Obesity is the leading cause of many diseases, from heart problems to diabetes. Green tea is rich in a catechin called epigallocatechin gallate (EGCG), which builds metabolism to burn calories and promote weight loss. A 2009 study published in the International Journal of Obesity found green tea to have a positive effect on weight loss and weight maintenance. A 2014 study conducted at Penn State showed that EGCG in green tea helps slow down weight gain by limiting fat absorption and increasing the body’s ability to use fat. Being high in antioxidants, green tea also strengthens tissue cells to help protect the body from premature aging (and age-related diseases). It also prevents cell damage caused by pollutants. Green tea can also fight cancer, prevent heart disease, reduce the risk of diabetes, boost immunity and lots more. Put 1 to 2 teaspoons of good quality green tea leaves in a cup. Cover and steep for 2 to 3 minutes. Strain, add a little raw honey and drink it. You can drink 3 to 4 cups of green tea daily. This pungent herb is an all-time favorite for people dealing with any kind of inflammation. 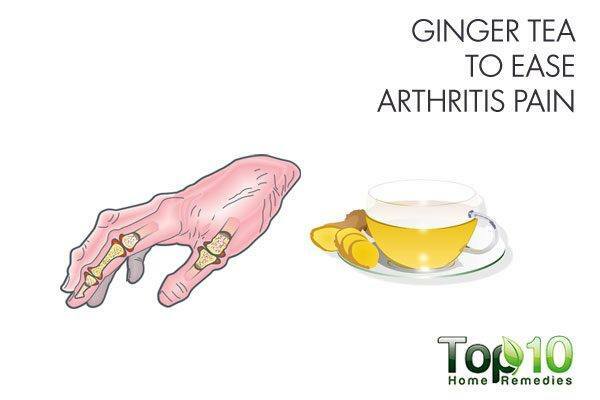 For those suffering from arthritis, ginger tea’s anti-inflammatory properties are very effective at reducing pain and inflammation. In addition, it helps boost circulation, which also helps combat pain. According to a 2001 study published in Arthritis and Rheumatism, ginger extract was found to be effective in reducing symptoms associated with osteoarthritis of the knee. Another study published in 2005 in the Journal of Medicinal Food found that ginger affects certain inflammatory processes at a cellular level. This makes it an effective treatment for arthritis and other inflammatory conditions. Apart from its anti-inflammatory benefits, ginger has antioxidant, antiviral, antibiotic, anticancer, antinausea, antispasmodic, antifungal and antitussive (cough suppressant) properties. Drinking ginger tea can also ease an upset stomach, curb nausea, reduce stress, fight a cold, reduce menstrual cramps, boost immunity, normalize blood sugar levels, regulate appetite, and relieve heartburn and bloating. Bring the water to a boil, then simmer for 10 minutes. Strain out the ginger slices. Add honey and a little freshly squeezed lemon juice. Drink 2 or 3 cups of ginger tea daily. When it comes to herbal teas for health, the list will remain incomplete without mentioning chamomile tea. It is one of the best herbal teas to fight insomnia and other sleep disorders. 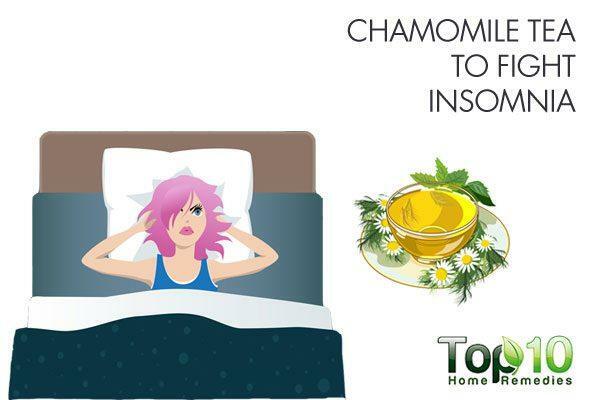 Chamomile is widely regarded as a mild tranquillizer and sleep-inducer. Its sedative and calming effects may be due to the presence of the flavonoid apigenin, which binds to benzodiazepine receptors in the brain. Chamomile also has antioxidant, anti-irritant, anti-inflammatory, antimicrobial, antianxiety, antispasmodic, antidiarrheal and anticancer properties. Drinking chamomile tea regularly can relieve headaches, reduce muscle pain, keep stress under control, relieve menstrual cramps, treat stomach problems, support weight loss and boost immunity, to name a few. Both the fresh and dried chamomile flowers can be used to make tea. Put 1 teaspoon of dried chamomile (or 2 teaspoons of fresh chamomile flowers) in a cup of hot water. Cover and let it steep for 5 minutes, then strain it. Note: Avoid this herb if you are pregnant or trying to get pregnant. 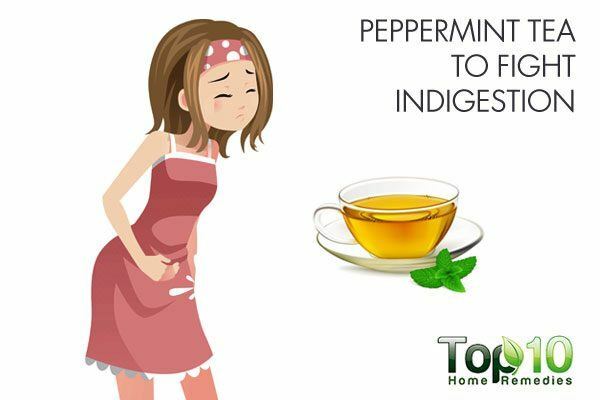 The refreshing and minty flavor of peppermint is all that you need to improve your digestive system when suffering from indigestion and other gastrointestinal problems. 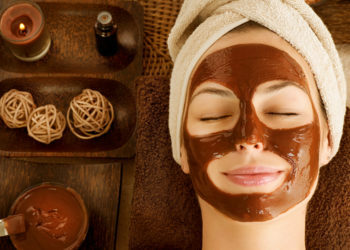 It soothes stomach muscles and the intestines. It also helps relieve irritable bowel syndrome symptoms, such as stomach cramps and bloating. In addition, it helps food pass through the stomach easily and helps relieve nausea. Being rich in menthol, peppermint has a cooling and calming effect on the body and mind. 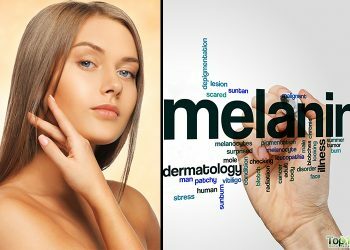 It also has antioxidant, antispasmodic, antibacterial, antifungal, antiviral and carminative properties. This herb also contains a good amount of manganese, copper and vitamin C.
Peppermint can also help treat muscle spasms, aid weight loss, combat stress, eliminate bad breath, alleviate headaches, treat migraines, support oral health, and prevent allergies and asthma, to name a few. Steep 1 tablespoon of fresh peppermint leaves in a pot of hot water for 10 minutes. Allow it to cool and drink it. You can drink 3 to 4 cups of peppermint tea per day. This herb, however, is not suitable for people suffering from acid reflux disease as it relaxes the sphincter muscle, which increases the chances of the regurgitation of stomach acid back into the esophagus. The beautiful fragrance of the herb basil is perfect for fighting bad breath, also called halitosis. Basil is rich in antioxidants and antibacterial properties that help fight odor-causing bacteria inside the mouth. This in turn can also ward off pyorrhea and various other periodontal diseases. A 2015 article by Oral Health and Dental Management evaluated the effects of chewing basil leaves on reducing the microbial count to control halitosis. Along with chewing the leaves, the aqueous solution of these herbal leaves was found effective at fighting bad breath. Also, basil is an excellent source of vitamins A and K, plus a good source of vitamin C and manganese. 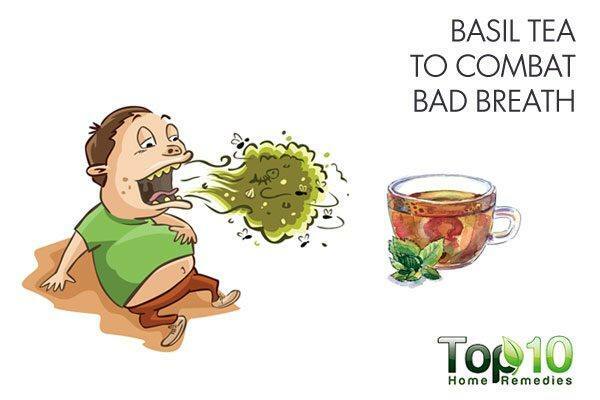 Drinking basil tea regularly can help reduce stress, uplift your mood, relieve indigestion, cure headaches, treat flatulence, improve appetite, boost immunity and lots more. Put 2 teaspoons of dried basil leaves in a cup. Cover and steep for 10 to 15 minutes. Strain and sweeten with raw honey, if desired. Drink 2 to 3 cups of basil tea a day. 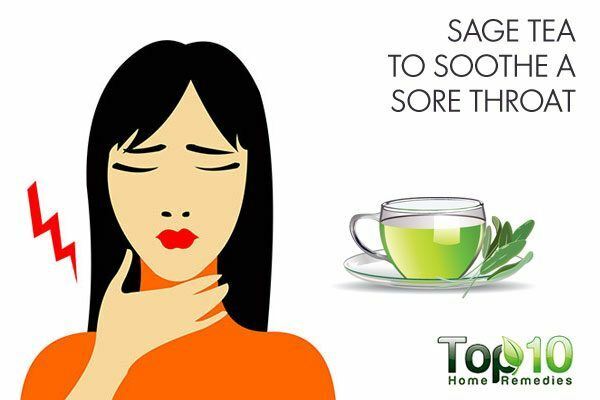 When you suffer from a sore throat, you can sip warm sage tea for instant relief. Also, it relieves irritation and inflammation in the throat. Its antimicrobial properties help fight off colds as well as soothe a sore and irritated throat by slowing the growth of harmful bacteria in the throat. A 2009 study published in the European Journal of Medical Research reports that an echinacea/sage preparation is as efficacious and well tolerated as a chlorhexidine/lidocaine spray in treating acute sore throats. Also, drinking sage tea regularly can boost your mood, reduce anxiety, maintain oral health, enhance memory, reduce menopausal symptoms, boost heart health, improve digestion and lots more. Put 1 tablespoon of fresh sage leaves (or 1 teaspoon of dried sage) in a cup. Pour in 1 cup of boiling water. Let it steep for 5 minutes, then strain out the leaves. Add some lemon juice and raw honey to enhance its taste and effectiveness, then drink it. 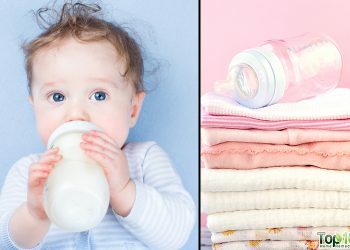 Note: Sage is not recommended for pregnant or breastfeeding women as well as those suffering from epilepsy. Lemon balm is an herb well-known for treating anxiety. It works as a mild relaxant and nerve tonic, thus aiding in reducing anxiety, promoting sleep and calming the mind. A 2011 study published in the Mediterranean Journal of Nutrition and Metabolism found that lemon leaf extract treatment helps improve mild-to-moderate anxiety disorders, its associated symptoms and insomnia. Also, a 2014 study published in Nutrients found that lemon balm products were capable of benefiting a number of aspects of mood and performance. 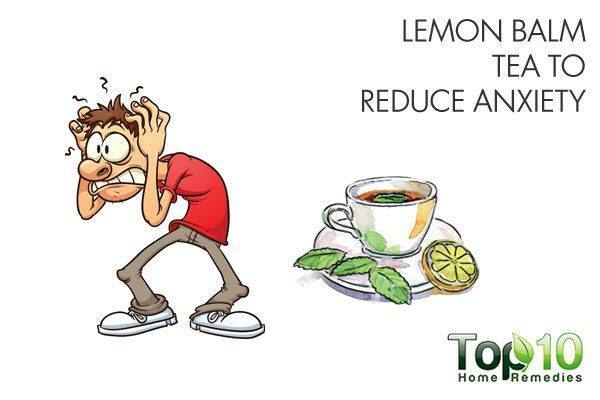 However, lemon balm drinks appeared to be associated with lower state anxiety and better working memory. Lemon balm is a natural antioxidant, antiviral, astringent, antimicrobial and antispasmodic agent. The leaves are rich in phenolic compounds and flavonoids. Drinking lemon balm tea regularly can make your skin look younger, boost alertness, sharpen memory, improve liver health, maintain blood sugar level, improve appetite and lots more. 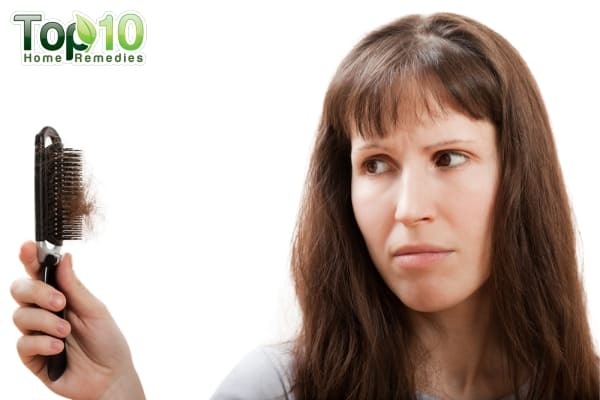 Put 1 to 2 teaspoons of dried lemon balm in a cup. Cover and steep until it’s cool enough to drink. Drink it just once a day. Dandelion is a healthy herb that can regenerate, cleanse and purify the liver. This powerful liver tonic helps metabolize fat accumulated in the liver, which in turn promotes proper liver function. It also increases the flow of bile and helps detoxify the liver. A 2010 study published in the Journal of Ethnopharmacology highlights the therapeutic effect of dandelion root on hepatic disorders. 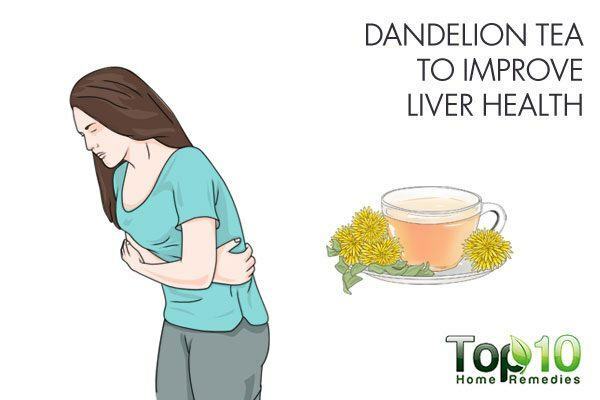 A 2012 study published in the Journal of Medicinal Food highlights the hepatoprotective effect of dandelion against the toxicity induced by acetaminophen, which is linked to different cases of hepatitis, cirrhosis and hepatic transplant. This herb is packed with essential minerals like iron, potassium and beta-carotene, plus vitamins A, C and D.
Drinking dandelion tea is beneficial in losing weight, normalizing blood sugar levels, removing toxins from the body, suppressing appetite, fighting inflammation, regulating high blood pressure and preventing urinary disorders, to name a few. Add 2 teaspoons of dried dandelion root to 1 cup of water. Remove it from the heat and let it steep for about 10 minutes. Strain and drink your tea. 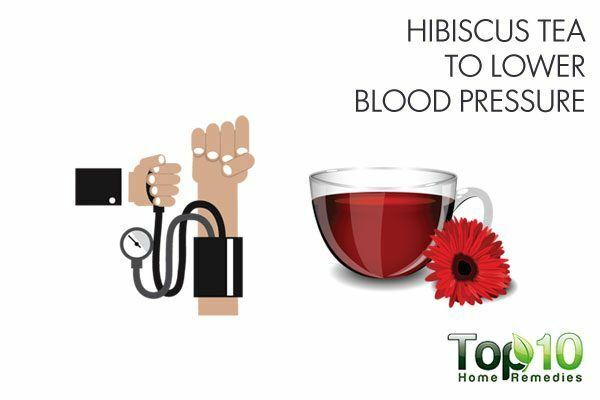 For controlling blood pressure, hibiscus tea is one of the best options that you should definitely try. Hibiscus contains antioxidant compounds that help prevent the oxidation of low-density lipoproteins (LDL or ‘bad’ cholesterol), which contributes to atherosclerosis and heart disease. It also helps regulate high blood pressure. A 2010 study published in the Journal of Nutrition reports that daily consumption of hibiscus tea, in an amount readily incorporated into the diet, lowers blood pressure in pre- and mildly hypertensive adults and may prove to be an effective component of the dietary changes recommended for people with these conditions. Other health benefits of hibiscus tea include lowering high cholesterol, improving digestion, strengthening the immune system, reducing inflammatory problems, supporting liver health and reducing the risk of cancer. 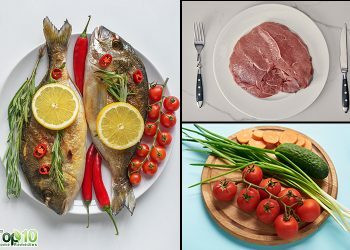 It can also speed up the metabolism and help with healthy, gradual weight loss. Add 2 tablespoons of dried hibiscus petals to 2 cups of water. Bring it to a boil, then simmer for 10 minutes. Strain out the leaves, then add raw honey and a little lemon juice for taste. Drink 2 to 3 cups of hibiscus tea daily. Note: If you are a pregnant or nursing, do not drink hibiscus tea as it may increase the risk of complications. Rosehips are a wonderful source of immune-boosting vitamin C. In fact, rosehips contain about 20 times the vitamin C as oranges. Vitamin C is a powerful antioxidant, which is important for the immune system and tissue health. It can help prevent both bacterial and viral infections. The antioxidants in rosehips also help improve skin elasticity and firmness and also reduce the appearance of aging signs, such as fine lines, deep wrinkles and brown age spots. 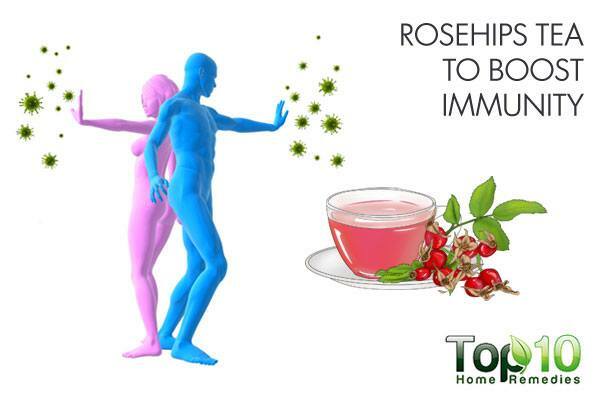 In addition, drinking rosehips tea boosts adrenal function, providing plenty of extra energy and alertness. Put 4 tablespoons of whole dried rosehips in a saucepan. Add 4 cups of water to it. Cover, bring it to a boil and then simmer for 5 minutes. Strain it into a teapot, and drink when sufficiently cool.